On Monday, President Obama hosted a symposium on the events of Ferguson, Missouri – in truth, a symposium on supposed police racism in America. Joining him at the White House were MSNBC’s Al Sharpton, whose record of racial reconciliation includes calling Jews diamond merchants and white interlopers, and New York City mayor Bill De Blasio, who has hampered the NYPD’s ability to fight crime in dramatic fashion. Obama took the opportunity to blast police. Obama stated that Brown’s shooting “laid bare a problem that is not unique to St. Louis…and that is a simmering distrust that exists between too many police departments and too many communities of color.” His solution did not include fighting crime. Instead, it featured body cameras for cops, as well as cracking down on the “militarized culture inside our local law enforcement.” Note the language: Obama doesn’t care about police being armed with military-style weaponry. He does care about a “militarized culture” – also known as a police culture. This is not likely to go over well with millions of Americans who watch Ferguson burn and wonder why the feds want to hamper the police. And that, in turn, bodes ill for the presidential hopes of Senator Rand Paul (R-KY), who also met with Sharpton last week. “We talked about his position on dealing with some criminal justice issues that I am concerned about,” said Sharpton. He said that he and Paul “don’t agree on much,” but they would work together. Paul has attempted to use Ferguson as a wedge issue on militarization of police. 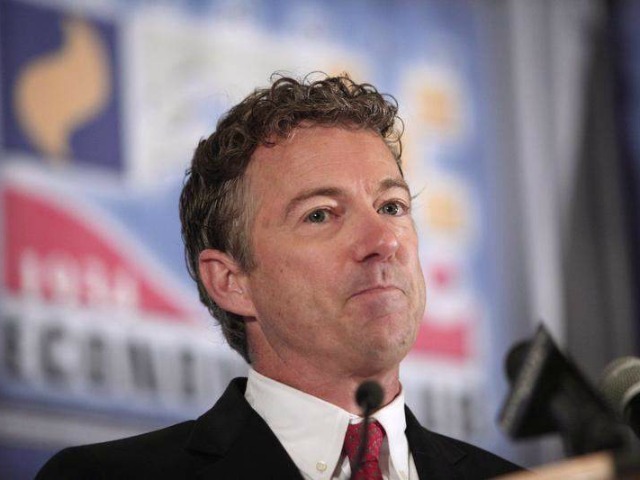 In a pandering op-ed for Time magazine back in August, Paul – who has also pandered to blacks on issues like voter ID (“I think it’s wrong for Republicans to go too crazy on this issue because it’s offending people”) – suggested that the criminal justice system was racist, and that arming it created a threat to American blacks. Given the racial disparities in our criminal justice system, it is impossible for African-Americans not to feel like their government is particularly targeting them….Anyone who thinks that race does not still, even if inadvertently, skew the application of criminal justice in this country is just not paying close enough attention. Our prisons are full of black and brown men and women who are serving inappropriately long and harsh sentences for non-violent mistakes in their youth. Paul has done advocates for demilitarization of police no favors by mimicking the Obama line that over-armed police represent symptoms of a broader racist police ill. And that nonsense will come back to bite him when he runs on a non-law-and-order platform in 2016.